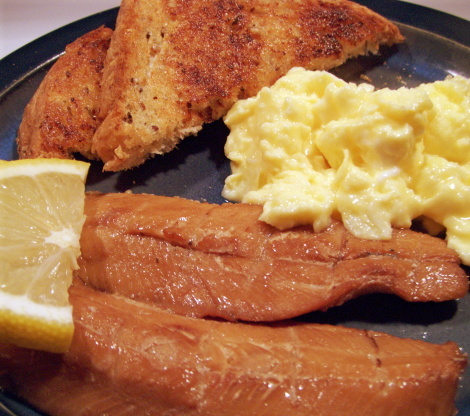 Smoked Kippers With Scrambled Eggs Recipe - Carolina Meat & Fish Co.
Smoked Kippers With Scrambled Eggs Recipe, just like Mum used to make. In a large skillet on low heat melt 1 tablespoon of butter and add the kippers cooking 3 to 5 minutes per side. In a bowl whisk the eggs, curry powder, milk, 1 tablespoon of butter salt and pepper. Pour egg mixture into another frying pan/skillet and on low heat gently scramble the eggs. Serve with the hot buttered toast and lemon wedges. 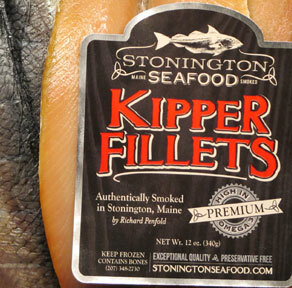 A kipper is a whole herring, a small, oily fish, that has been split in butterfly fashion from tail to head along the dorsal ridge, gutted, salted or pickled, and cold-smoked over smouldering woodchips (typically oak). In the United Kingdom, Isle of Man, Japan, and a minority of North American regions they are often eaten for breakfast. In Great Britain, kippers, along with other preserved smoked or salted fish such as the bloater and buckling, were also once commonly enjoyed as a high tea or supper treat, most popularly with inland and urban working-class populations before World War II.